So my husband volunteers at the Seattle Aquarium. 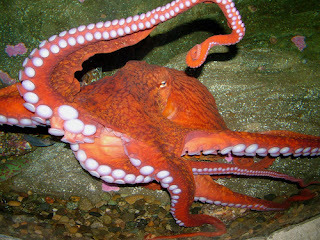 They’ve had two octopuses there for a while, in adjacent tanks. The tanks are connected by a tube about eighteen inches or so across, but since octopuses can be territorial, a screen is in place so the animals are aware of each other, but can’t, say, try to kill or eat one another. Which they will sometimes do if they have the opportunity. One of the octopuses recently started displaying reproductive behavior, pulling eggs out of her mantle and braiding them together. There are no male octopuses in the vicinity, so the eggs aren’t fertile, but policy is that when an octopus looks like she wants to breed, she’s released out into the sound. So Octopus Number One has moved on. The screen between the two tanks was removed, and Octopus Number Two now has access to both tanks. According to my husband, Number Two was positively gleeful today. She was much more active than she’s usually been, exploring, spreading her legs out, jetting a time or two, spending some time up at the glass looking at people — while he described it I could picture in my mind a cartoon octopus dancing around the newly-huge space and cackling, “Mine, all mine!” with a huge, cartoony grin. I assume the aquarium will acquire another octopus eventually, but until then Number Two will doubtless revel in her newly expanded territory. Sounds like she’s having fun with it. NOTE: Temporally Out of Order opened to submissions only upon funding of their Kickstarter, and there’s not a lot of lead time. It’s a cool theme, though, and they’re paying $.05/word, so I’m listing it for the speedy among you. While sitting at the airport waiting for a flight, I saw a phone booth with a note reading “Temporally Out of Order.” Obviously it was a typo, but the mistake takes on a whole new meaning when viewed from a science fiction/fantasy frame of mind. This anthology will take on the challenge of interpreting what “temporally out of order” could mean for modern day—or perhaps not so modern—gadgets, such as the cell phone, laptop, television, radio, iPod, or even that microwave or refrigerator! Edited by Joshua Palmatier and Patricia Bray, it will contain approximately 14 stories with an average length of 6000 words each. The anthology will include short stories by: David B. Coe, Laura Anne Gilman, Faith Hunter, Stephen Leigh, Gini Koch, Seanan McGuire, and Laura Resnick. Additional authors will be added as stretch goals, including Jack Campbell, Jean Marie Ward, and Juliet E. McKenna. All other slots aside from the named authors will be filled by the open call for submissions following the successful completion of the Kickstarter. World-altering events. It should be the kind of thing everyone has a memory of. A time travel story or two may be okay under this theme. Science Fiction is our conversation with the future. But what if we’re talking with alien voices? Bundoran Press Publishing House will open for submissions from September 15th, 2014 to January 15th, 2015 for a new anthology of science fiction stories to be edited by Mike Rimar and Hayden Trenholm. Second Contacts seeks stories which explore what happens fifty years after first contact, for us, for them, for our shared future. The possibilities are endless — conquest, collaboration, assimilation, or, even abandonment. On Earth, in space, or on alien planets, what will happen to individuals and societies after two generations or more of staring into alien eyes? Payment for first world English rights (print and digital) will be $0.02 a word to a maximum payment of $130.00 (all figures Canadian dollars). Our preferred length is 3500 to 6500 words. We will accept stories of any length to 10,000 words but the maximum payment will remain $130.00. A limited number of reprints (please query before submitting) may be purchased at a flat rate of $50. Payment on publication. Please submit in .rtf, .doc or .docx format.